Although it’s been around since 2008, YouTube annotations may be one of the most powerful YouTube features you’ve never heard of. Annotations are physically viewable, and in some cases, clickable layers that you put right on top of your existing YouTube videos. 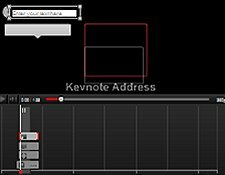 These layers alow you to add things like text, notes, and links to your videos, providing a more informative and interactive experience for your viewers. 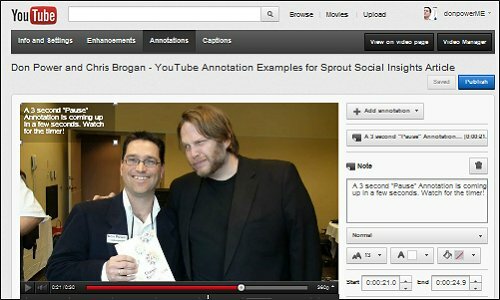 This article shows you the various styles of annotations currently available and how to add them to your YouTube videos. We’ll also show you some creative YouTube annotation examples that may inspire you to use this powerful, yet often overlooked video-marketing tactic. Speech bubble: This annotation behaves exactly the way you’d expect. Add it on the timeline of your YouTube video and a customizable speech bubble appears on top of the video as if someone is speaking, in cartoon fashion. Speech bubbles are linkable to other YouTube outposts. Note: Use the Note annotation to add informative text on your video. You can customize the size and background color of your note (font color is limited to black and white only), as well as the duration it remains on screen. Notes are linkable to other YouTube outposts. Title: Title annotations can be useful if you either omitted or did not have the editing tools to create a title in your video before you uploaded it to YouTube. Configuration options are limited, so you may have to tinker with this annotation to achieve the effect you want. Titles are not linkable to other YouTube outposts. Spotlight: The Spotlight annotation displays a customizable text message when the viewer scrolls his or her mouse over the area you’ve defined for this annotation. This can be an effective way to make a specific area of your video clickable to other related YouTube videos, playlists, or channels. Label: The Label annotation works very much the same as the Spotlight annotation except that the customizable text appears just below the frame you define for the annotation. Its appearance and configuration options are a little different than the Spotlight annotation too, so try both of these options to see which one best meets your needs. Pause: This annotation temporarily pauses your video for whatever duration you choose. It’s particularly effective when you’re displaying anything in your video that requires a viewer’s extra attention or input (like other annotations, for instance). Check out this video for a demonstration of all these annotations in action. Once you’re logged in to your YouTube account, click your account name in the top right corner of the screen, then click the “Video Manager” link. Find the video you’d like to add annotations to, then click the “Edit” button just to the right of the thumbnail corresponding to the video. Next, click the “Annotations” link located in the grey menu bar at the top of the page. You’re video will appear with a timeline underneath it. Click the pause button at whatever point you’d like to add your first annotation. 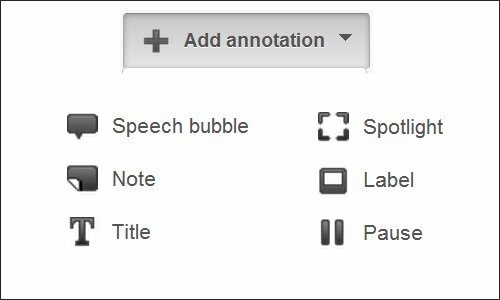 Click the “Add annotation” button on the right hand side of the screen and choose any of the six available annotation styles (see detailed descriptions in the section above). Each Annotation has its own set of configurable features which will appear in the right hand column of the screen. Some annotations are more customizable than others, so don’t be afraid to experiment with different styles until you find one that looks and behaves the way you want. You can easily edit any annotation by clicking on it in your timeline. The corresponding annotation layer will appear on your video. Drag it (and resize it) to any location you’d like it to appear on your video. You can also adjust the start time and duration of each annotation, either by selecting it in your timeline and stretching the red brackets, or simply making the necessary adjustments using the “Start” and “End” fields in the right column of the screen. Click the “Save” button each time you make any changes to your annotations. You can preview your annotations by dragging the playback marker back to the beginning of your video (or wherever you’d like to review your playback). When you’re happy with your changes, click the blue “Publish” button in the top right corner of your screen. You’ll see a confirmation message (“Published!”) along with a link to your annotated video on YouTube. You can edit or delete annotations from your videos at any time by repeating the process described in this section. YouTube allows you to add clickable links to all but the Title and Pause annotations. However, unless you’re a YouTube partner, the links are limited to other videos, playlists and channels on YouTube. You can also add links that give viewers the option to subscribe to your YouTube channel, or visit the websites of a variety of nonprofit Fundraising Projects. As for why or how you’d use YouTube annotations for business benefit, check out the video from creative agency, Boone Oakley, by clicking the image above. This video incorporates a variety of annotation styles to draw you into an interactive experience with the brand. Not only is this video a lot of fun, but it uses annotations creatively to highlight the features of the brand that make it truly unique. Are you using YouTube annotations in your own videos? Share your experiences in the comments below.